If you ever wondered where M. Night Shyamalan truly lost his overall appeal, it would no doubt be with Lady in the Water. To tell the truth, I’m not entirely sure why this is. The movie doesn’t exactly match the quota set forth in his earlier works, but at the same time, I don’t believe it even tries to. It’s true that this isn’t the best-written movie in the world, but it’s far from terrible. You can definitely tell it’s M. Night behind the wheel, and there is an overall tone of the film that is actually captivating…there’s just one thing you have to do before watching, and I’ll get to that in a minute. Lady in the Water is about a motel superintendent that unveils an ancient secret with a very specific and complicated history. When a mysterious woman comes out of the water in the motel pool, strange things begin to happen – and her life is threatened. It’s up to Cleveland Heep (Paul Giamatti) to find the people(s) that will help bring her home before it’s too late –all the while uncovering more of the world that she came from. Here’s something you need to keep in mind: this is an original fairytale that blends with reality in a very interesting light. There is a lot of backstory to this fairytale that, in theory, is ambitious and really quite interesting – but the presentation lacked a little. 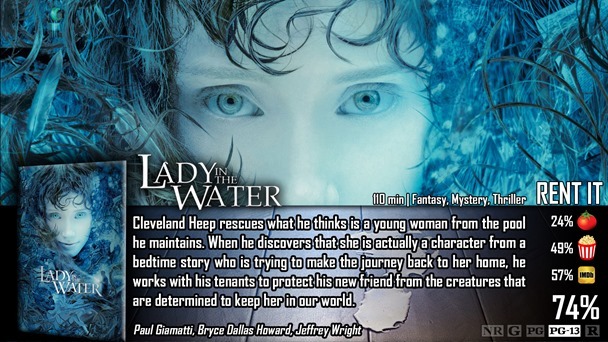 Throughout the film, Cleveland continually discovers more about this legend of the lady in the water, and you really start to believe it’ll never end. They’ll just keep making more stuff up, making her back story over-complicated in more ways than you can imagine, and it gets quite ridiculous. However, it’s supposed to. Again, this is primarily a mystery, not horror film. Going back to what I said earlier, you have to do one thing before watching this film in order to like it – you have to forget all of your knowledge in M. Night’s past, and expectations, and you have to watch it as if you didn’t know he directed it. It had the same problem as The Village – a really good, fascinating concept drowned out by too many throwbacks to his origins in horror. This makes the audience focus on the wrong things and miss the main points. The mystery that this film deals with was very smart. 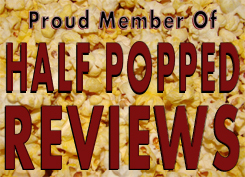 It had a poor presentation in parts, but if you get over that, you’ll really enjoy this movie. In the beginning, Cleveland really had nothing. No family, no real friends, just a job. Throughout the film, each and every character was unique, diverse, and acted as a puzzle piece to fill out his overall character development into something you can really love. The mystery – combined with the absolutely beautiful musical score, reminded you of Shyamalan’s glory days – particularly Signs. Here’s where it gets iffy, and where people didn’t connect with the film: the grass-like wolf-monster things that stalk the “lady in the water”. I get it, when I first saw this film, I thought they were really stupid and far too bizarre – making the film feel a tad incomplete and imbalanced. Also, the over-complexity of the bedtime story was really farfetched and not truly grounded in anything. Guess what? That was the point – it’s a fantasy, bed time story, fairytale all wrapped up in the real world. No different than Unbreakable was an origin story of a superhero in real life. M. Night has a way of making films that I can truly respect. He knows how to pick directors of photography, because all of his film have a unique feel to them. That is in correlation to how it looks, feels, and how the characters talk to each other. These movies are usually really quiet and soft-spoken, have some eerily-placed shots, and characters with mysterious pasts – which were all present here. M. Night himself also has a vital role in the film – not a cameo – and I loved it. I think he’s a great actor, honestly, and I hope to see more of him in the future. It’s not as bad as people put it out to be. At he heart of this film lies a ton of potential and complete originality that I can truly respect. M. Night’s use of camera-angles, music, and storytelling, are vastly and unfairly judged too harshly. I do understand where people are coming from, just not with the same ferocity. Some of the things said in the film are a little silly and overly far-fetched – which is really hard to connect with with an audience. Its ambition overreaches its success – so therefore – people hated it. Period. Bob Balaban as the film critic was both ingenious and hilarious, a critique from M. Night himself on the harsh words critics have given him and films in general – and an overall expression on how he devotes himself to being different than everyone else; being original – which is definitely how I would describe M. Night Shyamalan.